Anthony Steffen plays a brother recently released from a 10-year stint in prison, serving time for a murder he didn't commit. 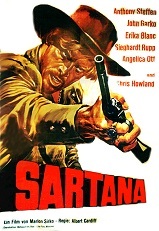 Upon being let out he finds that his brother Sartana (Gianni Garko) has taken his women and has become a high class criminal that runs a protection rackett. Steffen doesn't take kindly to this and with no support from his psychotic mother (who sides with Sartana), he takes the law into his own hands to wreak vengeance on the brother that has ruined his life. Also stars Erika Blanc. Comes from a very nice widescreen import print.